He’d been trained as a solider, after all. He knew how to fight. The same rules applied, if you thought about it, to books and to swords. For one thing, you didn’t run away from a challenge. You met it head-on. How interesting that after reviewing a children’s book last month about librarians and books with living power (The Wild Book), I came across a very similar plot line. Perhaps good ideas arise simultaneously all around the world. This current children’s book is equally exciting, with perhaps a bit more drama and fighting. Nevertheless, it is intriguing that both books feature a master reader known as “The Librarian” who has power over all books. 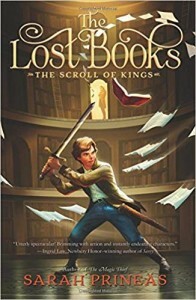 Action-packed and well- written, with interesting characters, The Lost Books holds its own very well. Both main characters – the young Queen, and the young Librarian–are equally matched and well-developed characters. There’s a bit more ‘evil’ in this librarian children’s book than in the Wild Book, but it’s not problematic, unless the young reader is very sensitive, or reading it alone in the dark at night. I handled this book by reading it on my porch on a sunny afternoon. In this end, this children’s book is more of an escapist adventure than any heavy moralizing, but it’s a great way to pass the time. I was delighted to discover the author was already on my website for her other series, including Winterling and Summerkin. Very well written, fast moving, and terrific characters. Recommended for kids who love adventure as well as books. Ages 10 and up. Best for 5th grade.